Warriors are you ready? asks Terry Corr, Head of Education of the AfriOceans Conservation Alliance over the sound of hundreds of excited AfriOceans Warriors, all cheering for their respective teams taking part in our awesome AfriOceans Warriors Challenge that took place on Saturday 1 December in Glencairn, South Peninsula. Then they were off, first on the skis which took considerable coordination and teamwork. 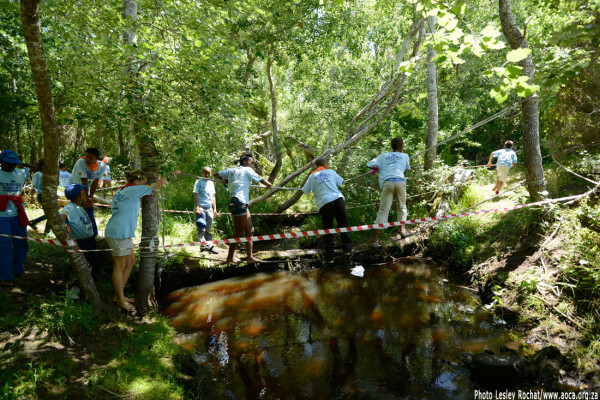 Then the teams of six were into the forest, over the bridge, through the spiderweb, over and under numerous obstacles and then over the river, hanging onto the rope bridge, with a swirling river below. Neck and neck the kids raced, with the Outdoor Warriors, a team made up of youngsters from broken homes in Ocean View emerging out of the forest first. As they crossed the finish line, they couldn’t actually believe that they had won. ‘I have never, ever won anything before; now I am a winner! 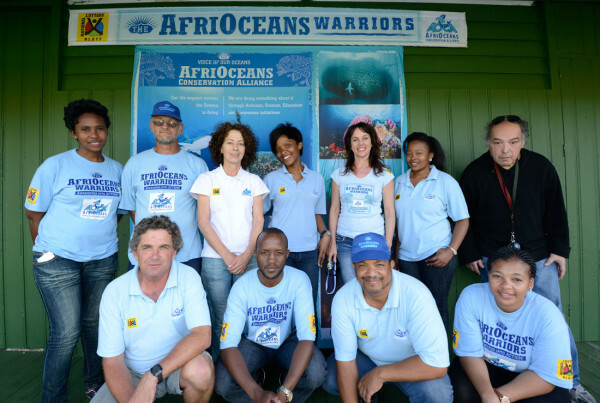 I love AfriOceans Warriors!’ one proud, beaming AfriOceans Warrior said. 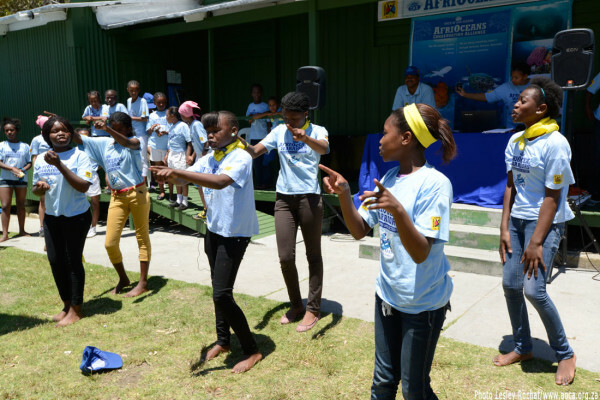 That is the story that repeated itself time and time again as more than 250 learners from 17 different Tribes or Eco clubs were put through their paces, taking part in this exciting event, a key component of the 3yr National Lottery Board sponsored AfriOceans Warriors programme. The challenge event marked the culmination of a year’s work and showcased each schools action projects that they had tackled, crafts made from recycled materials, an outstanding Eco Fashion show with garments made from plastic clean-up bags and collected chip packets and some exciting dance routines that had the audience going crazy. 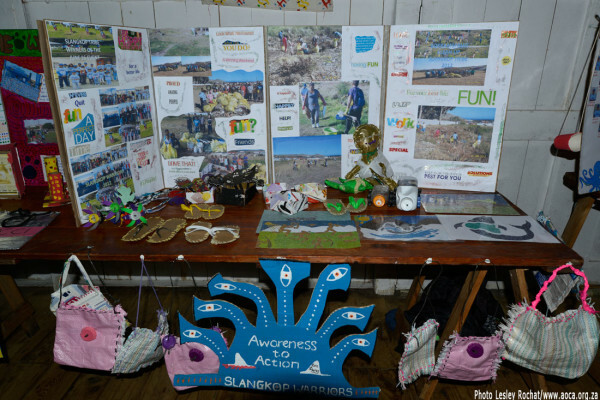 ‘This is all environmental education; it’s about empowering our kids, many from Cape Town’s poorest communities, to stand up and claim their environmental right to a clean and healthy environment’, remarked Terry Corr, who pioneered the AfriOceans Warriors concept together with internationally respected shark activist and founder of AfriOceans Conservation Alliance Lesley Rochat.‘ We believe there is a lot of merit in kids being outdoors, learning about our oceans and being taught how to take Action, and above all having lots of fun, whilst learning’, said Lesley Rochat. In turn, we selected six National AfriOceans Warriors Ambassadors, who will lead the fight to save our Oceans next year. They are: Amen Etaka, 2012 Ultimate Warrior, Westlake Primary School; AfriOceans Warriors Francis Hill & Erin Marsberg from Kirstenhof Primary School; Holly Ringwood & Anja Coulthard from Kommetjie Primary School and Tara – Lee Bam from Prince George Primary School in Lavender Hill. 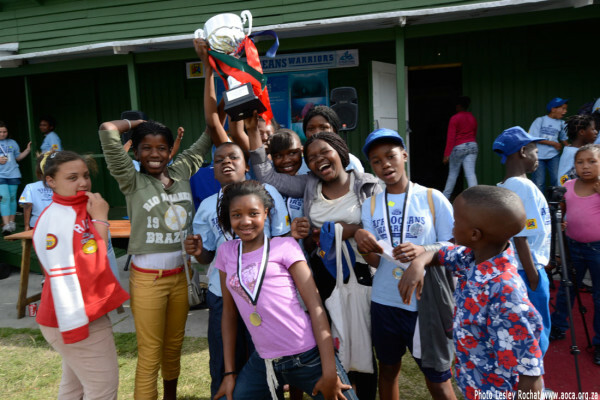 The magnificent AfriOceans Warriors trophy for the Blue School Tribe of the year was awarded to a delighted St. James Primary from Kalk Bay. Masiphumelele High school was awarded the high schools award. 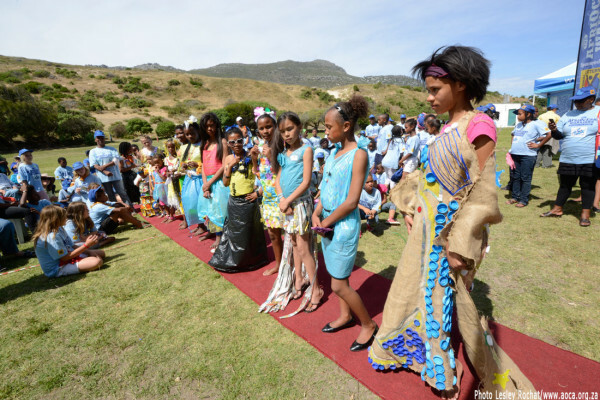 The AfriOceans Warriors project team has visited 17 schools, in 7 communities including Lavender Hill, Kirstenhof, Westlake, Kalk Bay, Masiphumelele, Ocean View and Kommetjie every week over the entire school year and have followed a curriculum linked Big Blue Life sciences programme that aims to build sustainability from the ground up. 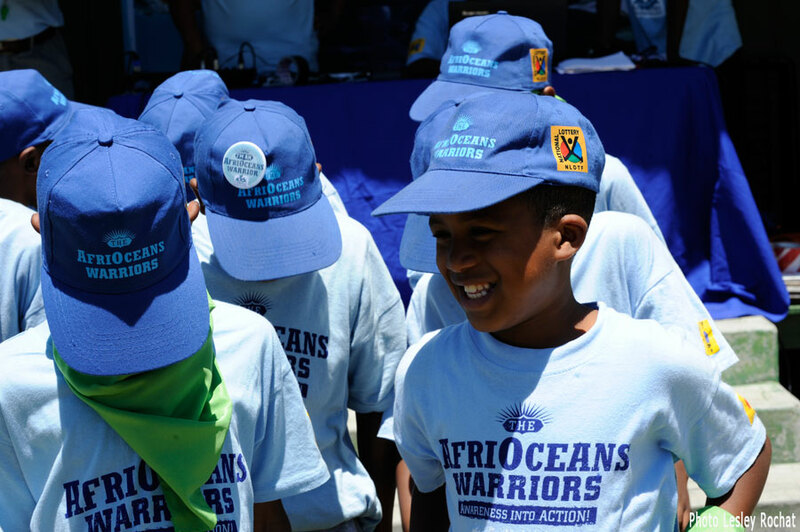 The response has been incredible, with learners staying at school after school closes to take part, earn their card and the right to wear the cool AfriOceans Warriors gear. Any event like this needs prizes and sponsors and we were extremely grateful to be able to offer some exciting prizes, including a cage diving trip, sponsored by African Shark Eco Charters, surfing lessons courtesy of Scuba Shack, educational vists to World of Birds, Table Mountain National Park, Eagle Encounters, Iziko Planetarium, Imhoff Snake & Reptile Rehabilitation Centre, Drakenstein Lion park and Chimp Haven. Our AfriOceans Warriors were well fed thanks to magnificent support by Food Lovers Market in Long Beach Mall and Ceres Fruit Juice. Thanks also go to Cape Medical Response for Medical Support and we were very pleased to say that no injuries were reported. Thanks also go to Chocolate Orange Events for the kind use of their PA system. A huge thank you must go to our awesome AfriOceans team, led by Lesley Rochat, Terry Corr Charmaine Rochat and Dr. Leonard Compagno, well supported by Environmental Educators Monica Sokudela, Ishmael Sabodien and Naomi Mdayi and our three CPUT interns Ovayo, Zinthatu and Sibulele. And as always, a huge ‘Thank You’ to the National Lottery Board who have made this Awesome Programme possible. 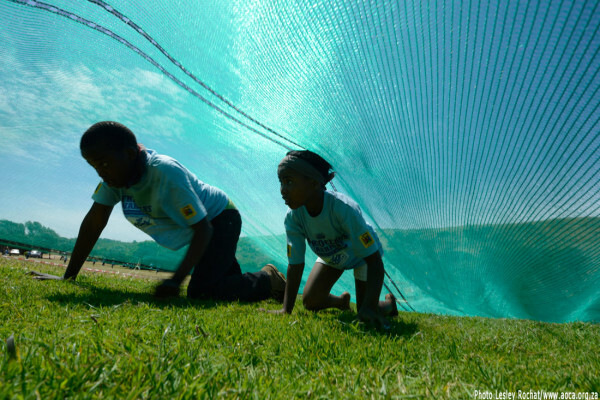 We look forward to taking the AfriOceans Warriors programme far and wide in 2013!